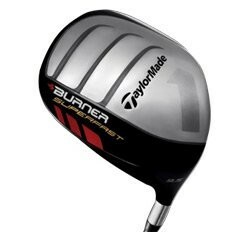 The TaylorMade Burner SuperFast uses extra length and extra speed to give you longer drives. The shaft is a long 46.5 inches and the head is shaped like the wing of a fighter jet. It's also very light, weighing in at 283 grams -- which is 17 grams less than the current TaylorMade Burner. Thus, if you add all these elements together, it equals way more yards then you are getting with your old driver. The question is: How hard is it to swing? And the answer is: just as easy as your old driver. In fact, you probably will find that it feels like you are swinging easier, but the clubhead is moving faster. What's more is the super large clubface is very forgiving and dampens the sidespin that causes the ball to slice, robbing you of precious yards. I like this driver for all levels. If this is more money than you are looking to spend, take a gander at the Adams Speedline Driver. It is another driver I like with a huge forgiving clubface that is designed to be aerodynamic. Was hitting last year’s Burner 265. Just finished my first nine holes with 2011 version. 2 drives over 300 . . . Wow!